Founded in 1995, eBay now sports 157 million registered users, and currently has around 300,000 stores trading at any given time. Many people who have begun to sell on eBay now derive their entire income from the goods they sell through eBay’s auction pages. With easy to use auction listings, and the ability to grow when your business is ready to expand, eBay offers an ideal small business platform. EBay has three basic ways you can offer your business’s goods for sale. You can simply list your items as ordinary auctions that registered users can bid on. The second option is to offer your goods at a fixed price that users must pay to buy the items. Lastly you can open a store on eBay that enables you to group your auctions together and brand your auction listings with a business name and logo. One of the beauties of the eBay system is that it has an integrated payment system called PayPal. EBay bought the online payment company PayPal several years ago, as it was the most popular means by which buyers paid for the auctions they had won. PayPal enables anyone with an email address to send and receive money. You can see an overview of how PayPal works on this eBay page: http://pages.ebay.co.uk/help/ebayexplained/paypal/index.html. Before you can offer PayPal as a payment option on your auction listing or your eBay store, you must register for the service and link your bank account to your PayPal account. This only takes a few days. You can see details of all the PayPal services on its dedicated website: www.paypal.com/uk. Once you have your account set up, anyone can then send you their payment for the goods they have bought. Even though eBay began as a site that connected users who wanted to buy and sell used goods, many of the auctions that began to appear were for new items that used eBay’s Buy It Now option where a fixed price was paid for the goods. EBay realised that sellers of new goods wanted their own eBay stores so they created eBay Express [www.express.ebay.co.uk]. 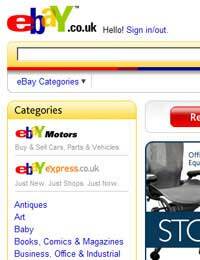 If your business will be selling new items that you don’t want to hold an auction for, eBay Express is the ideal solution. You will need approved seller status to open an eBay Express store as the service is aimed at professional users. The service works in much the same way as a standard eBay listing which means you can be up and running in minutes. How many items you sell on eBay will determine how much you can automate the process to save time. It can be incredibly time consuming to manually list more than a dozen items that you want to sell. The good news is that eBay have a number of tools that you can use to make your listing activities more efficient. This tool is completely free and allows you to create thousands of listings that you can then upload to eBay with just a click of a button. You also have control over how your listings look. Read more about this tool at: http://pages.ebay.co.uk/turbo_lister. After you have uploaded your auction listings you’ll need a way of keeping track of them. Selling Manager is an online tool that links to your eBay account so you can track every auction you have live at any given time. If you find that Turbo Lister and Selling Manager don’t have the features you need to manage your eBay business, you need Selling Manager Pro. It costs £4.99 a month to use, but has a raft of professional features to help you better manage your business. You can read about the support that eBay offers to business users on their website: http://pages.ebay.co.uk/businesscentre/index.html. Ebay also have an advanced selling guide you can download from their website: http://pages.ebay.co.uk/Seller_Tools_Finder. As a business platform eBay has grown to provide any size of business with an outlet that is easily managed and that can expand when this is necessary. The great strength of an eBay store is that you can put as much time and money into the venture as you like. This versatility makes it very attractive as a first business venture.